This was followed by the surprise decision to reject the club’s appeal against the yellow card shown to Alfredo Morelos for alleged simulation. However the striker is available for the visit of Kilmarnock on Saturday afternoon on Premiership business, opponents against whom he netted four goals on their last visit to Ibrox just 24 days ago in an overwhelming 5-0 home win in a Scottish Cup Fifth Round Replay. And Gerrard is fully aware of the challenge that awaits against a side that Rangers have yet to record a League win against this season. “They will have watched our second-half performance against Hibernian and our performance against Aberdeen and they’ll come with a game plan to try and take points away from us. 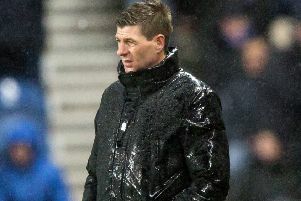 The Rangers manager has come under pressure of late but Gerrard has defended his record thus far. “The players will be well aware of how the supporters and the staff will be feeling. It’s about what you do on the pitch in terms of your reaction and your performance, individually and collectively. “The players will know how I’m feeling but we won’t change much in terms of our preparation. He rejected the suggestion that the season was as good as over for the Light Blues. Gerrard had mixed feelings as he reflected on recent outings. “I knew after a couple of results that weren’t favourable that questions would be asked. I’ve had it as a player and it’s not going to change now that I’m a manager, but after the game at Easter Road I was fine. “The performance in the first-half was probably the best 45 minutes we’ve played and we should have had the game done and dusted. The second-half wasn’t good enough - but there was a huge refereeing decision within that which has affected us not taking maximum points. He was frank and honest as he self-analysed, but was determined to remain positive. “Normally, you come away from games with a lot of positives - so I’ve been a bit low and a bit flat but I’m fine. I’ve picked myself back up and ready for the next challenge.